Earn $4.00 in Rewards credit. Click to learn more. 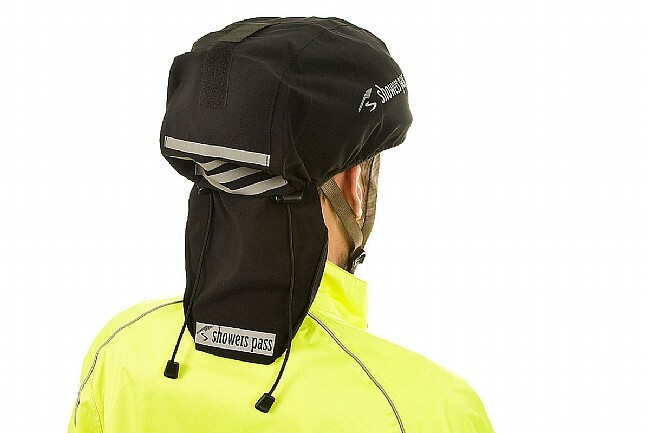 Leave it to Showers Pass to develop cycling's most full featured Helmet Cover. Their design is a step up from the traditional fare with a full waterproof and seam taped construction plus full circumference and depth adjustability. Unique removable drop down rear brim moves the rain down to your jacket, instead of your neck. 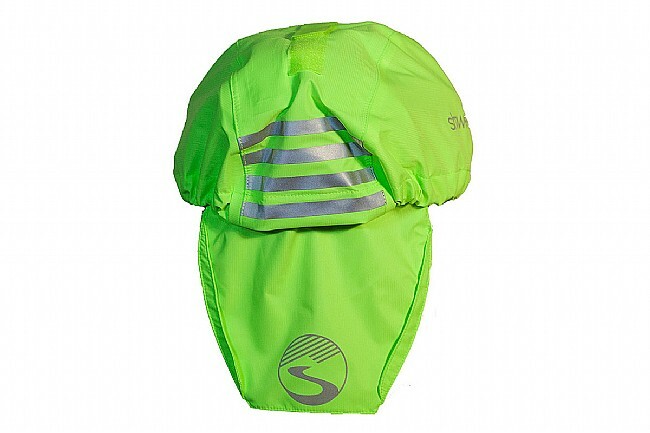 Reflective trim offers increased visibility on your commute or foul weather training ride. Universally sized for most helmets. Just finished a 200 mile RAAM Challenge ride with on and off rain all day and temps in the 40s. 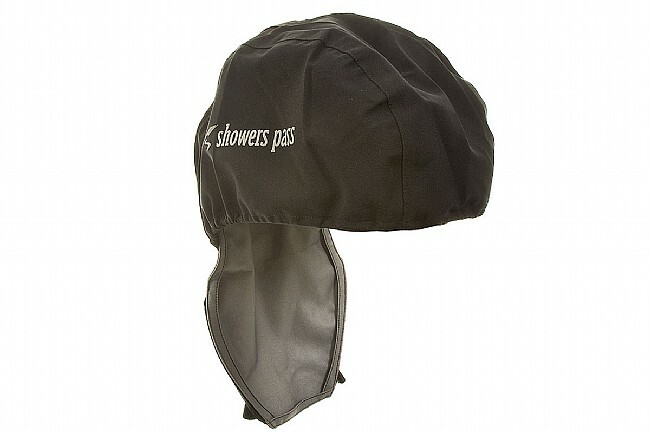 The Showers Pass Helmet Cover teamed with a GoreTex jacket kept my head and upper body dry and warm all day. Easy to install, this cover never leaked and stayed in place during fast descents. The back flap channels the water onto the jacket and keeps it out of your back. Definitely go to gear for future rainy day rides. 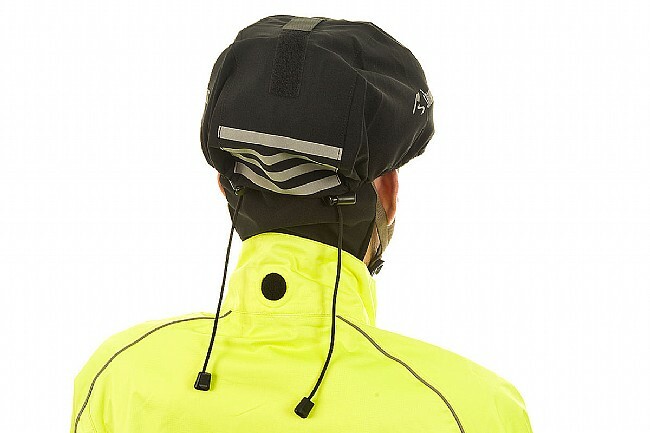 Works like it should, keeps head dry during rainy day rides. Been putting on many miles during this rainy winter and spring. I was using another brand helmet cover and water always seemed to find it's way in. 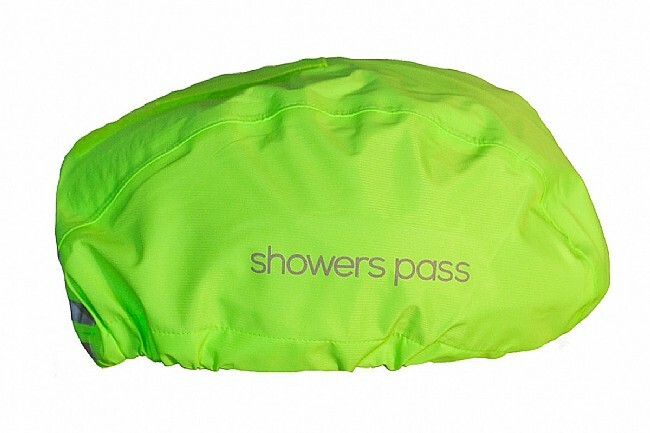 So, i purchased the Showers Pass cover. I have used it on about 10 rain rides. One in particular was about 2.5 hours and the heavy rain never let up. At the end of the ride my head was dry except for some sweat. When I looked at the inside of the cover there wasn't a drop of water in it. Very happy with the purchase. Nice rain protection, the flap on the bak has kept the rain off my neck on more than one occasion. 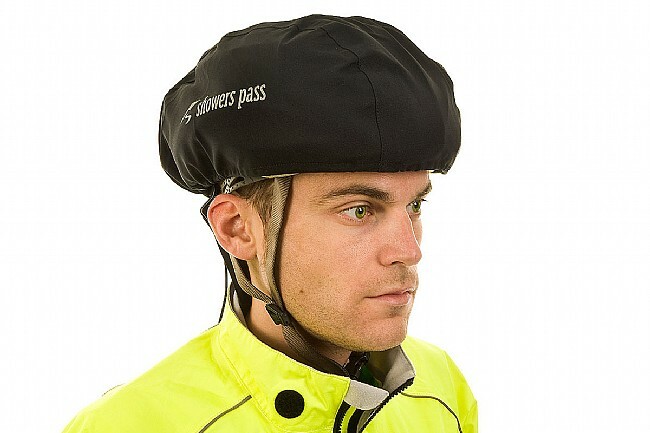 I RODE A CENTURY IN ONOFF DRIZZLE WEARING THIS SHOWERS PASS HELMET COVER. COVER DOES WHAT ITS SUPPOSED TO DO . THE NECK FLAP IS THE UNIQUE FEATURE THAT SETS THIS COVER APART FROM OTHER COVERS . I THOUGHT THE FLAP MIGHT BE ANNOYING WHEN TRYING TO SEE BEHIND ME BUT IT WAS FINE. I HATE RAIN AND ROAD DEBRIS SPLATTERING MY NECK AND RUNNING DOWN THE INSIDE OF MY JERSEY ON A LONG RIDE- YUK ! THIS HELMET COVER ELIMINATES THAT PROBLEM. OH, AND I GOT IT ON SALE FROM WESTERN BIKE WORKS ONE OF MY FAVORITE ONLINE STORES ! Lightweight and durable, offers complete water protection. Easily removal drop down brim for additional neck protection. May need to remove front visor in larger helmets. Seems to do what its supposed to do. Blocks rain. I thought rear flap would be annoying but its not. Has some reflective stuff on it which is good on the flap. Works fine over my Catlike whisper helmet.